Fall 2014 Nerf Blasters Starting to Appear In Stores & Online, You Can Buy Some Now! Thanks to many online, I was made aware that Nerf’s big 4 Fall 2014 blasters are now being sold on Amazon for their suggested retail prices. You can buy all of them right, except the CAM ECS-12 blaster. Amazon lists it coming out August 15. Singapore Nerfers can check the rest of this post for a bit of good news as well! I ordered myself a Demolisher and Slingfire, so look out for my coverage on that in the future. June 26, 2014 EDIT: Slingfire is currently sold out on Amazon. I’ll try and keep you all updated if/when comes back in stock. June 27, 2014 EDIT: 7 Slingfires are back in stock on Amazon. Be sure and grab one quick if you wanted to get one. EDIT 2: At least they were. Their sold out again. 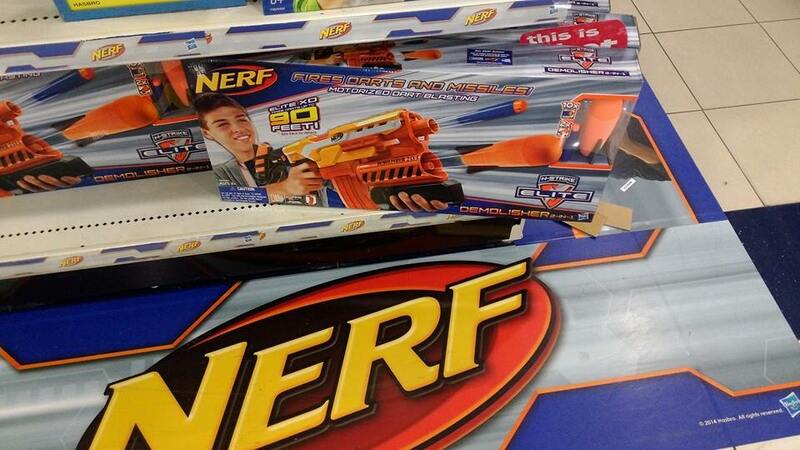 In the next bit of news, Toys R Us stores across the USA are starting to release the Fall 2014 blasters. 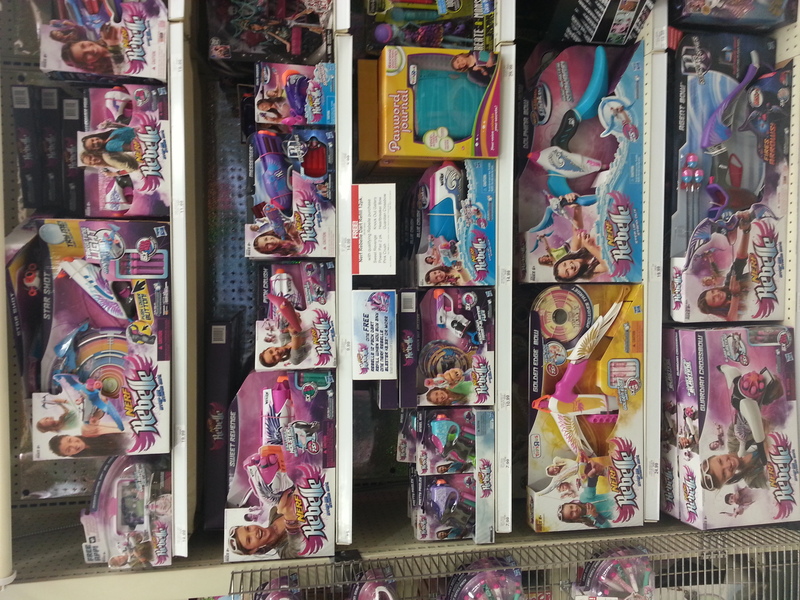 You can see most, if not all, of them in the photo I took above of my local Toys R Us. I got myself a Messenger blaster, you can view the unboxing below. And last but not least, the Demolisher is now being sold in Singapore! There are unboxing videos and photos of it, but I’ll save that for another post. You Singapore Nerfers be sure to enjoy this blaster. My latest pack from Nerf is on the Mega, some of the Zombie Strike, and Super Soaker spring lines. Feel free to leave me a comment let me know what blaster you wanted reviewed next! I already have some unboxing, firing, and range test videos. I can go into more indepth, game tested reviews for some of these blasters already. Feel free to check below for some of my video coverage on the Crossfire Bow & Sidestrike Zombie Strike blasters. I’ve got two new videos up today! Their an unboxing and range test video of the Zombie Strike Sidestrike. You can view the unboxing video above, which also contains a small firing test and my initial thoughts on the blaster. Below you can find a range test video of the blaster. I can talk a lot more about the Holster that comes with the blaster, so I decided to make that another separate video. I’ll upload that one later. Hey readers, I’ve uploaded two new videos today! The first is an unboxing on the Zombie Strike Ricochet blaster. I also give a few firing tests and my initial impressions on the blaster. You can view that video above. The second video that I’ve uploaded is a Range Test of the blaster. You can view it below. I finally got my hands on a 30 pack of these new Elite Suction darts. I must say, out of the box, the foam is more noticeably denser then other normal Elite Darts I’ve held in the past. This should mean increased durability for these darts. I’ve also heard online that these darts get a better grouping on shots at the cost of slightly reduced range, so hopefully I’ll be able to get some battle footage and get out there and do some accuracy/grouping tests for you all to help prove or disprove that. I finally got an Elite Ammo Box off Amazon and decided to review it for you all. My video unboxing of it can be found above, while my full video review of it and it’s features can be found below. I’ll try to have a write up review of this item in the future. 0:00 – 3:05 – Filling up the box with 100, 200, and 300 Darts to see how many it can hold. 3:06 – 6:22 – Small stress test and trying to find weak points. 6:23 – 7:25 – Overview and Final Words about the box. Here’s my unboxing video, and the first one on the internet, of the Nerf Zombie Strike Crossfire Bow. I also give off a small firing test which starts at 2:30 in the video. It’s a nice feeling and looking blaster. Paintjob was good and plastic seems good as well. It also features the “Smart AR Sensor” similar to the Rough Cut. Stay tuned to my Youtube channel and blog for more coverage of this in the next couple of days.